Scientists, exploring how to tame random gene fluctuations as an embryo starts to form a body, may have identified a control switch in how vertebrate cells segment into body parts. The switch was found in the "clock" managing development of the model species — zebrafish. The Cell Reports article uncovers methods for modulating genetic signals to prevent birth defects and cancers rooted in the earliest stages of development. A multi-institutional team studies developmental systems of zebrafish because the fish share common genes with humans. They are ideal models for studying early human development, explains Ertugrul Ozbudak PhD, a member of the Division of Developmental Biology at Cincinnati Children's Hospital Medical Center and the study's principal investigator. Ozbudak's team examined development of vertebrates at a stage called somitogenesis - when blocks of cells called somites, pair up bi-laterally along the front-to-rear-axis of an embryo. In vertebrates, somites become the deeper layers of skin, cartilage, skeletal muscle, etc. Researchers counted every single transcript (or copy) of genes in the zebrafish segmentation clock to find out that clock genes have a very low range, or magnitude, of RNA (ribonucleic acid). RNA carries genetic instructions controlling protein formation that will initiate cell segmentation leading to specific tissue identities. The authors found that random variable oscilation of gene signals during somitogenesis aren't controlled from inside the genes, but are driven by external sources, such as the complex chemical processes of cell metabolism. These external fluctuations in gene signaling are suppressed by the Notch pathway of genes and proteins. Notch is known to act as a switch controlling cell expansion and transformation into specific tissue types. The research demonstrates Notch also serves this role during zebrafish somitogenesis. Ertugrul Ozbudak: "Our results suggest variability in gene expression is controlled by a balance between time delays and when cells are actively signaling vertebrate tissue. Further investigation should shed light on the accuracy of natural development clocks in animals and humans. This could help inspire robust synthetic oscillators that might prevent certain birth defects or cancers." Although the potential for having a beneficial clinical impact remains years away, the work gives hope for new possibilities that could positively impact long term health. Take the possibility of preventing cancer. During embryonic development, Notch is busy working as an activator of genes in the Hes family. Hes genes are known to vary their signaling during early development of the vertebral column, as well as in other tissues. Dysregulated Hes genes are also highly expressed (functioning) in several types of human cancer, including rhabdomyosarcoma, a cancer affecting the body's connective tissues. Perhaps in IVF fertilization, the ability to oscillate and control gene expression at the earliest stages of development raises the question of whether it might be possible to stop early genetic programming as an embryo forms, that might cause cancer years after birth. Taming cell-to-cell variability in gene expression is critical for precise pattern formation during embryonic development. To investigate the source and buffering mechanism of expression variability, we studied a biological clock, the vertebrate segmentation clock, controlling the precise spatiotemporal patterning of the vertebral column. By counting single transcripts of segmentation clock genes in zebrafish, we show that clock genes have low RNA amplitudes and expression variability is primarily driven by gene extrinsic sources, which is suppressed by Notch signaling. We further show that expression noise surprisingly increases from the posterior progenitor zone to the anterior segmentation and differentiation zone. Our computational model reproduces the spatial noise profile by incorporating spatially increasing time delays in gene expression. Our results, suggesting that expression variability is controlled by the balance of time delays and cell signaling in a vertebrate tissue, will shed light on the accuracy of natural clocks in multi-cellular systems and inspire engineering of robust synthetic oscillators. Also collaborating on the study were scientists from the Department of Genetics at Albert Einstein College of Medicine; the departments of Computer Science, Biology and Mathematics at Colgate University; and, the departments of Electrical and Computing Engineering, Biomedical Engineering and Mathematical Sciences at the University of Delaware. Funding support also came in part from the National Institutes of Health (GM111987, GM122956) and a Colgate Picker Interdisciplinary Science Institute Grant. 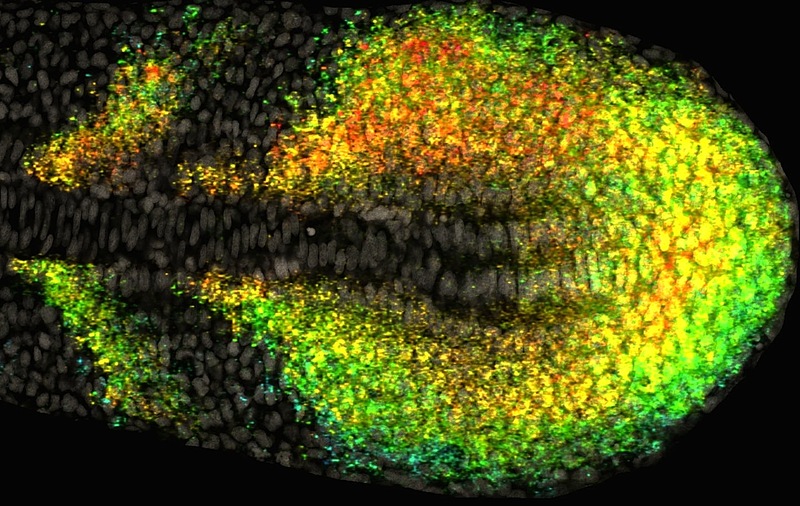 This image highlights the movement of single RNA molecules of a developing zebrafish embryo. Genes in the embryo's segmentation clock oscillate, showing high and low expression along the axis of unsegmented tissues. RNA molecules are colored depending on their position in the tissue. Oscillations stop as groups of cells form segments. Cell nuclei are the color GRAY. Scientists believe a possibility exists their research might offer clues into how random gene fluctuations can be tamed during these earliest stages of life and one day help prevent birth defects or cancer. Image credit: Cincinnati Children's Hospital.